As I mentioned in a previous post, I strongly suspect we are witnessing the end of an era: the end of UK angel investing. Over much the same period, angel networks have moved from being subsidised by the government to being paid for by entrepreneurs, yet their dealflow has become so low that few (if any) can be in any kind of comfort zone right now. They’re waiting for the ‘investment mojo’ train to return to their stations, but… perhaps the points have changed. Hence, while I’m in favour of positive government action to encourage angels to start investing again, I can’t help but wonder whether this would now only turn out to be a very short-term help. 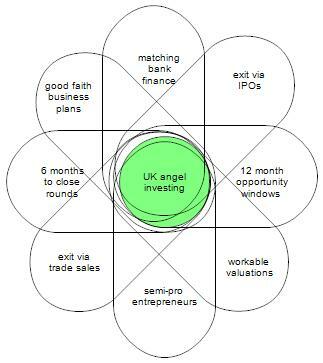 The big trick would be – Wayne Gretzky-like – to aim where the puck is going, rather than where it was a few years ago (in the anti-Newtonian hope that everything will magically reverse direction, just because you want them to): but if you look at the diagram above, I don’t currently see any trends moving towards a new angel investment setup in the UK. Please tell me if you think I’m wrong! 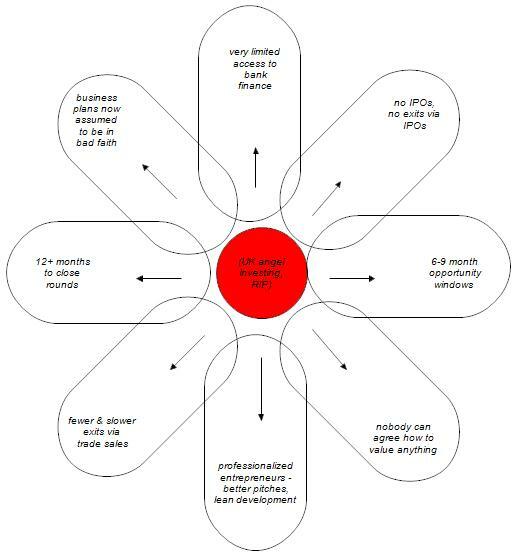 Long-term, I think the best thing for the whole sector would be for a whole load of disintermediated international angel networks to set up – and in the process write all the current (i.e. the last) generation of angel networks out of the picture. Sure, they’re all run by lovely, helpful, positive people – but the whole concept is little more than a bull-market hangover, Cellini imperial salt cellars sat on tables full of empty plates. In the short-term, I think that the best policy hack for London would be for the government to revise the terms of the Enterprise Finance Guarantee so that banks simply aren’t allowed to require entrepreneurs to use their primary residence as collateral. This small (and actually very equitable) change would mean that the kind of low-level funding required for a good number of London-based startups would – if you can produce a suitably bank-friendly business plan that you can back up with evidence – be directly fundable, without recourse to angels at all.